As I've written before, there are days, occasionally weeks, where finding interesting cars to write about is tough. Today was one of those days. I kept skimming eBay, Craigslist, etc., looking for something, anything. I passed by the listing for this car a couple of times, because, quite frankly, the little eBay photo makes it look like a dune buggy. No, I wasn't desperate enough to write about a dune buggy. Finally, I clicked on it, just to see what it is. This is no dune buggy. Not even close. 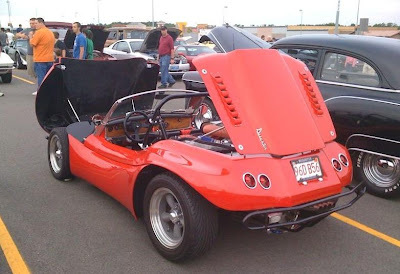 Yes, it's a kit car with a VW engine, but it has been built and engineered like no other kit car I've ever seen. This car does 0-60 in 4.6 seconds. It has a top speed of 125 MPH. 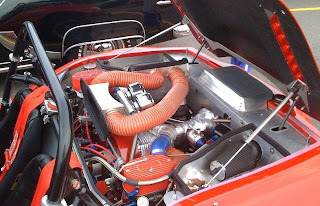 It's engine is a 2332cc VW Type-1 engine with a pair of Webers and a Garrett T04 turbocharger. It's been dynoed at 270 HP at 10 psi of boost. According to the seller, it's capable of approximately 330 HP at 15 psi, but at that point needs racing fuel. 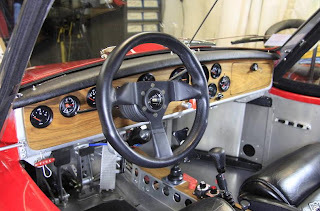 The seller writes, "Serious time, money, creativity and innovation were invested into building this car." That's an understatement. Everything is first class on this car. Located in Hopewell, MA, click here to see the eBay listing. Looks like a great weekend backroads car, and like you I'd probably dismiss it as another dune buggy until seeing it under the skin. Great surprise factor for newer, "faster" cars, I'm sure! Brilliant. I wish I had his talent. Major automobile companies don't engineer cars like this. Just great! I wonder why he didn't use a Porsche engine, though? The VW engine barely fit... note the spacers under the carb. manifolds. I grew up on VWs and that's really what drove me to use VW power. Thank you all for the compliments!